Sweet Jane Pattern - Woolly&Co. 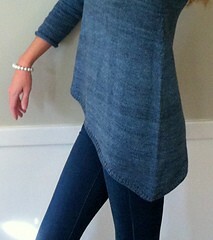 A sweet little everyday sweater with a twist! The slanted hem gives it a bit of kick while the stockinette keeps it classic and wearable. 34 (36, 38, 40, 42, 44, 46, 48, 50, 52)“ bust circumference. Pullover shown measures 36”, modeled with 3-4″ positive ease. The Plucky Knitter Traveler Sport (65% merino, 20% silk, 15% yak; 325 yd /100 g): Skies of November 5 (5, 5, 6, 6, 6, 6, 7, 7, 7) skeins. Appx 1400 (1480, 1565, 1645, 1725, 1810, 1890, 1975, 2055, 2140) yds—exact yardage will vary! Size 5 (3.75 mm) 16” and 29” circular (cir) and set of double pointed (dpns) and size 3 (3.25 mm) 29” cir and dpns. Adjust needle size if necessary to obtain the correct gauge. This pullover is worked from the top down as follows: The back is cast on, shaped with short rows and worked down through the armholes. Then the front shoulders are picked up from the back and worked separately until neck shaping is complete. The fronts are then joined and worked through the armholes. Front and back are then joined and worked in the round. The asymmetrical hem is shaped with short rows. Sleeves are picked up, shaped with short rows and worked in the round. Finally, the collar is picked up and worked.